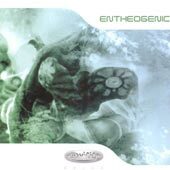 Back in the early 90's i, like every other overeducated schmoe in this country, was fascinated by Enigma's new age gregorian chanting dance hit, Sadeness. And later i enjoyed Sweet Lullaby from Deep Forest, which was a very similar new agey dance song, only the samples were from some sort of Pygmy tribal gathering. I am sure that you remember these hits: smooth keyboard samples from the electronic new age scene, combined with odd "world music" samples and light club beats. I thought that this stuff had come, enjoyed its moment in the sun, and then faded away. Well, Engima still release an album every so often. (Their second, The Cross of Changes was pretty good, but they went downhill after that.) And Deep Forest still exist (although i got bored with them during their second album). For the most part, though, i thought that this type of music was gone. And then i heard Entheogenic. Entheogenic, apparently, do not know that this sort of music has faded from popular consciousness. They have produced an album of smooth electronic keyboards with a vaguely new age feel, combined with world music samples and light beats. In fact, there is a track on this album that i consider to be a real standout in this genre. It's called Liquid Universe, and it follows the normal pattern for this type of music: it has world vocals (singing in, i think, Arabic), combined with genre-standard childrens voices, and pipes (those pan flute things i think). The real difference is the beat that this is all layered over: it's a funky breakbeat that reminds me of, well, something... (Roni Size? Something from the mid-90's. Something i enjoyed a lot then. In fact, i have spent much time pouring back through my records searching for what this reminds me of. I have yet to hit it, but have re-listened to some fine old discs.) At any rate, the beats are more frenetic than normal in this type of music, and it really helps the track standout. It is quite finely done. The rest of the disc is pleasant music that falls clearly within the new age world dance music genre. It is electronic music that is non-threatening and vaguely relaxing. If you insist on following the latest glitch hits, then this is not for you. If, however, you hang out in new age bookstores sipping tea, then this is probably something you will really want to track down.